MCC Dice In Stores This Week! Home » Latest News » MCC Dice In Stores This Week! That moaning and groaning you are hearing isn’t leftover zombies from Halloween, it’s the fans waiting on the arrival of the Mutant Crawl Classics dice! This week both Grakk’s Rad Dice and Kilra’s Glow Dice hit stores! Our Kickstarter backers have already received their shipments (and if you are a backer and haven’t gotten your order, please let us know! ), and now they are being released to the public in general! Grakk’s Rad Dice are a beautifully disturbing green color that immediately takes your mind to “mutant” and Kilra’s Glow Dice glow in the dark like any fully irradiated item or person should. Be sure to check out our Retailer Locator to find the store nearest you so you can catch these dice before they mutate and attempt to conquer the world! If you can’t find them, we also have them now in our Online Store, assuming they don’t take over our minds and…and…wow, what was I talking about? 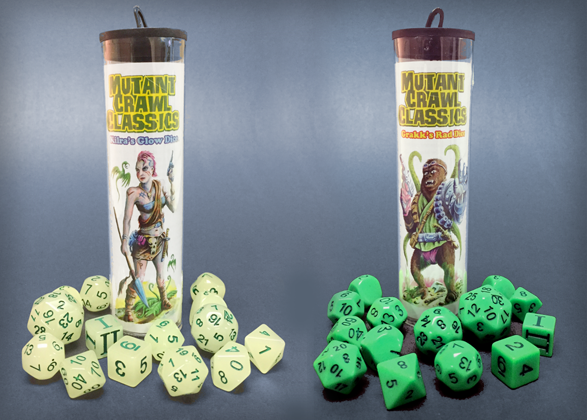 In any case, visit your FLGS this week and pick up your Mutant Crawl Classics dice sets! Both Grakk and Kilra are waiting patiently for you to join their cause.